Zarzycki Manor Chapels, Ltd. had the privilege of honoring three graduates at Willow Springs School on Monday, May 21 with our annual educational scholarships. The funeral home has been presenting the scholarships since June 1989. Each scholarship is in the amount of $100 and is awarded to the top two scholastic average graduates. The scholarship was intended to benefit students in their initial year of high school. Claudette Zarz ycki (far right) presented the awards on May 21 at the school's graduation ceremony. The two recipients of this award were Jordan Wendt (left) and Emma Szponder (center). In addition to these honors, a second scholarship was awarded to a female graduate. The Agnes Zarzycki Achievement Award is in honor of the foundress of the family owned and operated business 103 years ago. In 1915, Agnes Zarzycki showed great courage, strength, leadership and independence within her community. Isabella Tharp (right), who received a $100 scholarship, showed these qualities and more. We believe that the future lies with the success of our young people," said owner Claudette Zarzycki. "We believe that excellence in our schools is a direct reflection of excellence in leadership and that is why we continue to award our scholarships: an honor designed to identify, recognize, reward and encourage students." On May 31, we once again had the privilege to present our annual Zarzycki scholarships at the Graduation Awards Banquet at St. Richard School. Congratulations to graduates aleria Gutierrez, Celia Valencia and Brianna Arceo! The n on June 1, we presented our annual scholarships at the Graduation Mass at St. Bruno School. Congratulations to graduates Emily Rubalcava, Naya Diaz and Jacob Witek! People talk about many things with their loved ones: from day-to-day details to big events. Sharing stories with those who matter most isn't just important today; it will be especially significant when it's time to commemorate a life. Zarzycki Manor Chapels, Ltd. is proud to announce its participation in Have the Talk of a LifetimeSM, a national effort to encourage families to have conversations about life and what matters most. These discussions can help families make important decisions about how they wish to remember and honor the lives of their loved ones. Through meaningful memorialization, that is, taking time to refle ct on the unique life of a loved one and remember the difference they made, families and friends take an important step in the journey toward healing after death. We are pleased to offer individuals and families a free brochure, Have the Talk of a Lifetime, that will help begin a conversation about life. It's not easy to talk about death. We believe this brochure will be particularly helpful because it focuses on life, rather than the details of a service. It's life stories, family vacations, pieces of advice, favorite pastimes, that will help you remember those who matter most and begin to heal after they die. Click here to download your free Have the Talk of a Lifetime brochure. It's Not Every Day One Turns 100! We are extremely honored to have been selected as the 2015 featured firm by Nomis Publications, Inc. It is a true honor to be recognized by this leader in the funeral industry reporting funeral home and cemetery news. As 2015 marks our 100th Anniversary as a Zarzycki Family owned and operated funeral home, this recognition is especially significant. We are humbled, we are honored. Thank you Nomis Publications, Inc. The following was written by the editors of Nomis Publications, Inc., before the featured article. Click here to read the article published in the October 2014 issue of the Funeral Home & Cemetery News. 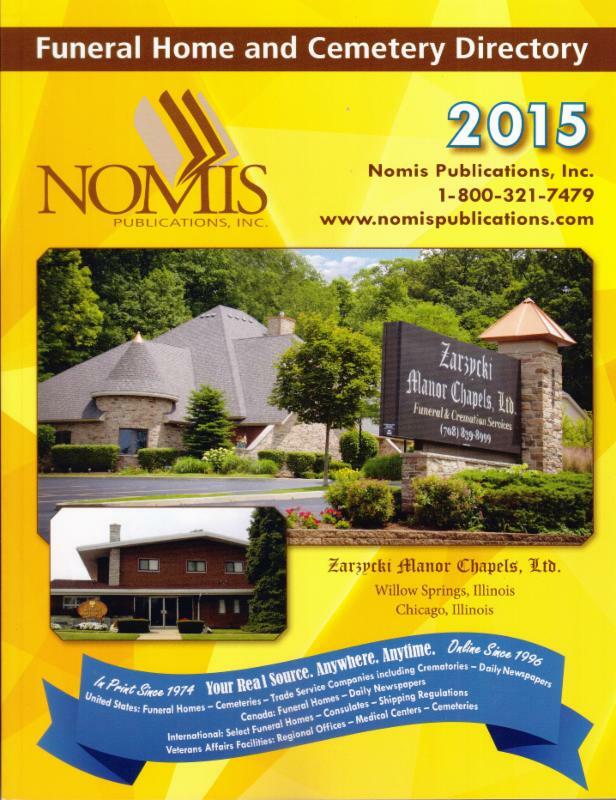 "While the history at Nomis Publications, Inc. does not date as far as that of this year's featured funeral home, Zarzycki Manor Chapels, Ltd., we do feel a connections as a women-run operation. Being owned and operated by women, we at Nomis greatly admire the foresight of Agnes Zarzycki in founding her business and the fortitude of her female descendants operating the firm today." "At Nomis we are proud to remain a family owned firm. Through our dedicated employees we strive to provide the industry the most accurate information available. From the print directories to the newspaper to all of the new features of our website, we are constantly updating our data. As 2014 ends we will have completed the 35th year of publishing the Funeral Home & Cemetery News while introducing our 41st edition of the Funeral Home & Cemetery Directory." -Nomis Publications, Inc. 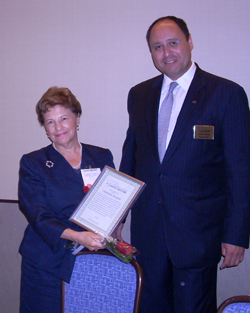 The Illinois Funeral Directors Association honored Charmaine Zarzycki of Zarzycki Manor Chapels, Ltd. as a 40-year licensee of funeral service at their annual convention in Schaumburg this past June. Mrs. Zarzycki was recognized for her contribution to funeral service, as well as to the Illinois community. A life-long resident of Chicago's southwest side, Charmaine graduated from Northern Illinois University in 1963 where she earned a B.S. in Education. Her teaching career began in Burbank District 111 and continued at the American School System in Japan. She married Richard Zarzycki in 1969 and began her studies at Worsham College of Mortuary Science where she graduated in 1971. Mrs. Zarzycki is the owner and operator of Zarzycki Manor Chapels, Ltd. located in Chicago's Archer Heights community and in the Village of Willow Springs, along with her two daughters. She is an active member of the Catholic Council of Women (C.C.W.) at St. Richard Parish. Along with her position as a funeral director, she also is a Certified Preplanning Consultant. Mrs. Zarzycki joins more than thirty Illinois funeral directors honored this year for being licensed in the funeral profession for forty and fifty years.